Conservation translocations are inherently risky. One way managers can attempt to mitigate some of the risk is by using models to understand the outcomes that a reintroduction may have on an ecosystem and its species. Hunter et al. 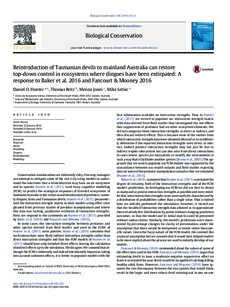 (2015) used fuzzy cognitive modelling (FCM) to predict the ecological responses of forested ecosystems of mainland Australia to the removal and introduction of predators; namely dingoes, foxes and Tasmanian devils. Hunter et al. (2015) parameterized the interaction strength matrix in their models using effect sizes gleaned from previous studies of predator manipulations and where this data was lacking, qualitative estimates of interaction strengths. Here, we respond to the comments on Hunter et al. (2015) provided by Baker et al. (2016) and Fancourt and Mooney (2016).